ASN article: Cameron Carter-Vickers: "I Am Leaning to the USA"
Cameron Carter-Vickers: "I Am Leaning to the USA"
What's that? A 16-year-old English-American dual-national central defender who started for the U.S. under-23 team against Brazil and has a high ceiling? That's right, and ASN's Brian Sciaretta spoke to him. FAILING TO QUALIFY for the London Olympics was a major disappointment for U.S. Soccer—Caleb Porter knows it, Jurgen Klinsmann knows it, everybody knows it. Perhaps as a result of missing out last time around, the current U-23 cycle has begun earlier than usual, with youth coaches Tab Ramos and Javier Perez already trying to assemble a core group of players that can make a deep run at the 2016 games in Rio de Janeiro. And the most surprising name in the player pool might just be Cameron Carter-Vickers, a 16-year-old Tottenham academy product who participated in the U.S. U-23 team’s recent camp in Brazil. The English-born Carter-Vickers was the youngest player on the roster by nearly two years. His only prior experience with a U.S. youth national team was an August U-18 tournament in the Czech Republic. “I wasn’t expecting it all,” Carter-Vickers told American Soccer Now. “I was with the U-18s two months ago and then to get another call-up to this was a bit unexpected." Unexpected but not entirely unpleasant: "All the other players have all been really friendly and they’ve tried to make me feel comfortable,” the teen added. Carter-Vickers made the U-23 squad primarily because of the elite quality he showed when American coaches scouted him with Tottenham and with the U.S. U-18 team in August. A stalwart in central defense, Carter-Vickers helped guide the U.S. squad to the tournament title, going undefeated with wins over Hungary, Czech Republic, and Ukraine. He was discovered by U.S. Soccer last December when Tottenham’s academy team played at a tournament at IMG academy in Florida. The U.S. U-17 team was also playing in the tournament and a member of the coaching staff became aware that Carter-Vickers might be eligible for an American passport. With Carter-Vickers impressing in Florida, the U.S. U-17 staff notified U.S. U-18 head coach Javier Perez about his potential availability. Earlier this year, Perez visited Carter-Vickers in London and he also spoke with Tottenham’s coaches to bring him into a U.S. camp. Initially it was tough because Carter-Vickers had commitments with school and with Tottenham—where he had begun training with the first team. “Tottenham was very, very high on him,” Perez said. “That day I met him, his mom, and his coach, I think it was one of his first training sessions for the first team. It’s remarkable to see such a young player so confident and so respectful because boys who are successful at these early ages have a lot of challenges. He looks to be someone very smart and obviously someone who can perform well not only on the field but he’s down to earth. He basically has all the ingredients to be a very good player in the future. “He’s a special player,” Perez said. “We didn’t have any hesitation to bring him in with the U-23s. It’s a big jump usually for a player who is doing well for the U-18s. For that trip to the Czech Republic, it was a very positive surprise to see how well he did with the team. So in discussions with coach Jurgen Klinsmann and coach Tab Ramos we made the decision to bring him to Brazil. Mukwelle Akale is the captain of the U.S. U-18 team and is poised for a move to Villarreal in January. He and most of his teammates knew nothing about Carter-Vickers ahead of the tournament in the Czech Republic. Afterward, however, everyone knew that they uncovered a gem. Dual-national players are a constant presence within the U.S. Soccer system, particularly on the 2014 World Cup team. The connection these players all have to the United States differs and Carter-Vickers also has a unique path. Carter-Vickers’ father, Howard Carter, is a former professional basketball player from Baton Rouge, La.. He played an integral role on LSU’s 1981 Final Four team and is considered one of the best-ever players from Louisiana State University. He was drafted by the Denver Nuggets in the first round of the 1983 NBA Draft but after two seasons in the NBA with Denver and the Dallas Mavericks, Carter moved to Europe. There he enjoyed a long career in France, eventually becoming a French citizen and enjoying a brief stint with the French national team. The senior Carter eventually ended his career playing in Greece, where he met Carter-Vickers’ mother—an English woman who was working in Greece. The couple was never married but lived in England briefly when Carter-Vickers was born. Eventually, Howard Carter returned to Baton Rouge but he was always involved in his son’s life, with Carter-Vickers usually making an annual trip to Louisiana and the father making frequent trips to London. Athleticism runs in the family as Carter-Vickers has impressed both Tottenham with his speed, strength, size, and ability to read the game. In his early years, he excelled at many sports but as Howard Carter put it: “I think he chose the right sport.” Still, despite excelling at different spots, both the father and the son share a common bond in athletics. “It’s a pleasure to see him do well,” Carter said. “I’ve seen him play several times in England as he was growing up and he’s always played up an age group. I shared with him that it’s having a strong work ethic, being careful of the company you keep, being respectful, and being humble. I am happy he is representing the United States. He was very excited about it. He sent me pictures of him with his American teammates. "I was just a proud parent. It brought tears to my eyes every time he does something great." "But he told her don’t worry about it,” Carter added with a laugh. As a dual national, Carter-Vickers has the option of playing for either the United States or England. To this date, however, only the United States has shown interest. His reputation, however, is growing in England. 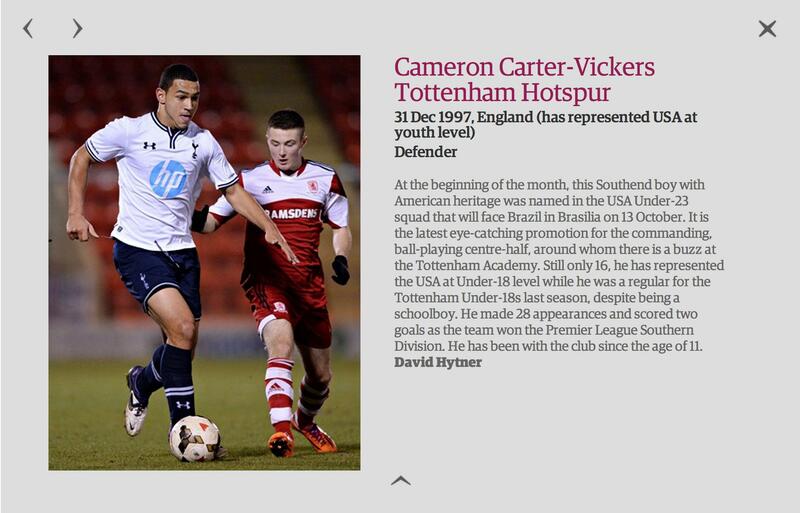 In a recent feature article in the Guardian, the top prospects for each Premier League team were profiled, and Carter-Vickers was selected for Tottenham. Should his native England come calling, it's impossible to say how the situation would play out. But Carter-Vickers is adamant that his goals are to make it with the U.S. next year at the U-20 World Cup (he is also eligible for the 2017 U-20 World Cup) and the following year at the 2016 Olympics. “England never called me up, so it was quite an easy decision,” Carter-Vickers said. “It kind of made the call for me. I definitely like the way the U.S. is set up. I knew they had that quality in the USA. It definitely matched my expectations. The players were good, technically they were very good. I like U.S. Soccer and both times I have been called into camp, it has been a really good experience. Carter-Vickers is now back in London with Tottenham where he plays with both the club’s U-18 and U-21 teams while also occasionally training with the first team. He has been with the club since the age of 11 but this is the first season as a full-time player. Progressing through its academy all the way to the first team would be extraordinarily difficult, but the talented 16-year-old is up to the challenge.